This unique planner/diary will help make 2017 the year to be inspired, stay focused, and achieve your goals! 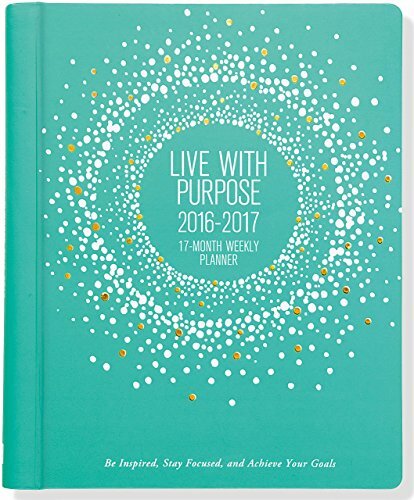 Live with Purpose Weekly Planner covers 17 months (Aug. 2016 -- Dec. 2017). Weekly spreads prompt you to define personal and professional priorities, break them down into steps to take, and evaluate progress as you go, to direct your course toward making wishes, hopes, and dreams a reality. Includes pages to map out goals visually, as well as tips on how to stay on track. Also includes prompts to evaluate your progress at the end of each month. Striking teal-hued cover design features gold foil detailing. Gloss highlights add polish. Raised embossing lends a dimensional effect. Pocket inside the back cover holds notes, forms, etc. Calendar is sized right -- 21.6 cm wide by 27.9 cm high -- for your desk, counter, or tote bag.